Every Little Helps - a Lot! 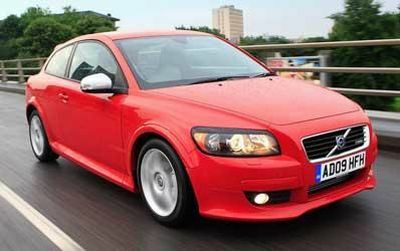 I have always recommended the Volvo C30 I for those motorists looking for a compact car with a more than a hint of quality. It is certainly one of best looking 3-door hatch backs around, especially when viewed from its rear which reminds me of the stylish 3-door Volvo 480ES, (produced from 1986 to 1995), notably the similarity of the one-piece glass tailgate. Clearly there are some more practical and roomier rivals, particularly when it comes to the rear accommodation. The limited luggage space is also compromised by both the high floor/tight aperture. 50/50 split folding rear seats can at least provides for say three adults and luggage. Having re-established these factors the big news is that Volvo has recently seriously enhanced this car’s environmental status by the addition of a version equipped with the latest Stop and Start technology. And it is no gimmick! The test example employed a similar mechanical package as my earlier test car, i.e. a 1.6-litre turbo diesel engine producing a useful 107.5 bhp and delivering the business through a five-speed manual gearbox but where that earlier car returned a range of about 565 miles between fuel stops this one, provided the system was fully exploited, could return up to a massive 857 miles! What is more Volvo claim a 74.3 mpg combined fuel cycle and exemption from the dreaded Vehicle Excise Duty thanks to a sub 100 g/km figure. However, nothing comes to he or she who does not deserve it and one has to ensure that the gear lever is in neutral when stationary to make the engine switch off. As soon as a gear is engaged the engine re-starts so the real bonus is gained by those who literally spend a lot of driving time in stop-start conditions rather than cruising the motorways. You do your bit and this car will do its. Initially I found the situation a bit uncanny but with experience of this a Stop + Start systems on Audi, Toyota and Citroen cars I am getting accustomed to the way of life. I now hope that the car in front of me is also so equipped enabling me to benefit from the elimination of exhaust fumes when stuck in a jam. That’s the bonus, the free lunch, the real benefit for a car that costs only about £1,500 more than the standard version. As far as overall performance goes this 1.6SE turbo diesel version is probably sufficient for most drivers in the market sector, providing a claimed top speed of 118 mph with 62 mph (100 kph) reached in an acceptable 11.9 seconds allied to a frugal fuel consumption potential. I also found that the diesel unit proved quieter than the 1.6-litre petrol powered entry level version. At the wheel I felt relaxed appreciating the comfortable driving position, the smart and logical fascia with its clear to see 4-dial instrumentation and a control layout proving every bit as good as the larger Volvos. My comfort was achieved by a good combination of an adjustable lumber support, a tilt and reach adjustable steering column and good pedal spacing (but no footrest). Visibility from the driving seat is actually much better than the average hatch back. The C30 is an entertaining drive thanks to good/light feel through the controls, a suspension system that takes variable road surfaces in its stride and also generates strong road grip, an insulated ride and effective braking qualities. Perhaps not that sporty a drive but immensely competent. The basic car comes well equipped with items like alloy wheels, climate control air conditioning (with innovative carbon monoxide sensing/avoidance intake system), 4-speaker CD system automatic headlamp levelling and home safe lighting etc, the SE adds bigger wheels, automatic rain sensor windscreen wipers, steering wheel mounted audio controls and a rear spoiler etc. Finish is to a very high standard, the test car featuring part leather trim and the interior trim features tasteful good quality materials while the build quality, as ever with a Volvo, should ensure long survival of the both car and its occupants. Currently most of the car news is about electrically powered or hybrid models and probably this Stop and Start technology may be an interim phase but the fact it is here now and can deliver good results under the right conditions. BMW: The BMW730Ld model has won the Professional Driver magazine’s Chauffeur Car of the Year award, beating rivals from Lexus and Mercedes-Benz. Judges particularly favoured the diesel powered car’s economy at a combined 40.9 mpg. FORD: A voice control system is now available from as little as £150 on the Ford car range – standard on the top models, optional on the smaller models. The system can operate climate control, audio and satellite navigations systems. LAMBORGHINI: The exotic Italian car producer has opened a further two dealerships in China, bringing representation to seven outlets. LEXUS: Production has commenced on a 500-only run of a 575 bhp LFA super car powered by a 4.8-litre V10 engine redlined to an awesome 9,000 rpm and driving the rear wheels via a 6-speed sequential gearbox. UK price will be a massive £336,000. MAZDA: According to used car evaluations experts CAP, the Mazda MP3 model has scored serious residual values boost of up to £750. MITSUBISHI: An all-new on-road Crossover vehicle has been announced. Sales are due to begin in Japan in February 2010 and the first European viewing will be at the Geneva Motor Show in March 2010. NISSAN: Buyers of new Nissan cars, ordered before 31 December 2009 and delivered by 31 March 2010 have been promised to have the impending VAT increase knocked off up to 2.5%. SKODA: UK sales for the first three quarters of this year topped a recession-busting 25,000 cars and world-wide sales for the same period were 6.5% above those of the same period in 2008. SUZUKI: A new 3-month deferred payment system has been launched enabling buyers of new models to beat the pending VAT rise due in January.